I don't have an exact weight, but am guessing the cab is around 2500 pounds. The reason I think that is how the load pulled when I took the cab to Matt. I've hauld similar weight on that trailer that was 2500 pounds. Great job Matt!!! BJ, your grandfather would be very proud of the restoration of the 186. Thanks for sharing the story and pictures with us. I hope its home before then. We don't want to haul it in the snow/salty roads. Cab complete with glass, doors and floor deck still in the bottom has to be less then 1500 lbs. I am not sure of the exact weight but the specs on the little off brand loader we have has a lift capacity of 1500. Once the floor deck was removed and I took the doors off it made it alot easier to handle. It's quite easy,. I use a wooden beam or actually a cross arm(the ones on top of electric poles) from work. Put 2 eye hooks in the end and lift. When installing the cab I use shipping blankets for cushions. The beam rest on the side pieces that hold the headliner in, no damage and it's a safe and easy pick. Here a better view, the cab is 100 % balanced right on,. I would not lift them any other way.. Danny, (Dirtboyz) would even back me up on this one. Gotta ask how many hours do you have into this project ? Awesome work Matt!!! That tractor looks better than new and beautiful BJ!! I like you kept the loader on it, your grandpa would be proud to see it like that! Nice job Matt! You do great work and you have a really nice shop! BJ I really like your tractor and I think it looks better than new! Looks great. Lots of time spent and it shows. Grandpa should love it. Absolutely beautiful job!! Matt that looks amazing!! BJ you must be one happy IH owner?! After reading fellow forum member, B.B. 's topic about all his 86 series I learned that HyCapacity has the correct style seat cushions. The replacement cab came off a 3788 that had the later style hydraulics. We found the blue and yellow lever covers inside, and decided to use them. Also I had Matt transfer the old serial number tags off the old cab. Ha! I'm glad my nonsense at least helped someone! Seat looks great in there! That tractor is absolutely beautiful! 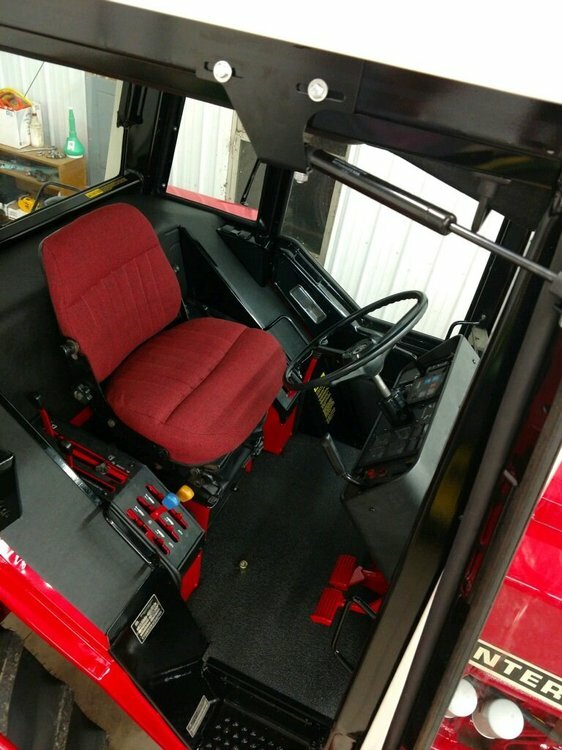 Matt did a great job on the cab alone, little alone rest of the tractor! I'd have to find another tractor to actually use as that one is too nice to put back into service! Wow, that looks nice, and while I have no idea what it costs, and probably don't want too, it looks like it was worth it! Interests:Is it Plow day yet? I can't begin to imagine the financial pain that this level of work must have caused. The detail of work is just outstanding, it's just beautiful! Grandpa said we could have bought two of them brand new (back in the day) for what we've got in it, including the engine. That was replaced in 2014. Interests:Farming and anything related to it. Wow... I think I need to say it again, WOW! BJ, that looks great. You have really done your grandfathers tractor up right. I hope to see it up close sometime. I’m gonna say it one more time, WOW. I'm planing to have it at the Ohio Chapter 6 Show in Gibsonberg in August. Verrrryyy cool. I didnt realize Gpa was alive. Get a vid of him standing there when you open the door on the shed the 1st time. Matt..... i have a huge amt of repect for you. We need to do a engine in a 3400hr 186 we are thinking of doing a "Long Farms" type restoration on and selling. Seeing that old gal stripped....man that takes alot of hrs to get broke down. You should (and you family) be very proud of your abilities. I can almost hear my grandparents elation and scorn for the same reason. LOL! I thought painting the loader and putting it back on was going to be a real chores. It ended up being pretty easy, when it's completely dismantled it's easier to handle and put back together. 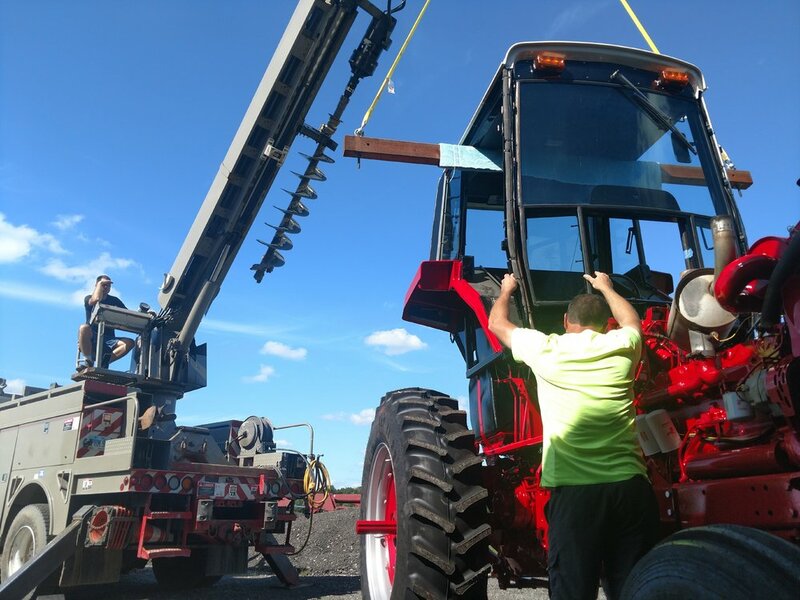 The worst part of job was putting back in the 2 lift cylinders for the boom, those things are heavy! !